When you delete files using the recycle bin, the files still exist sitting on hard disks ready to be recovered. With simple recovery software easily available, any file can be recovered without a great deal of determination. The files have simply been marked or relabelled by Windows as no longer needed, so are simply ignored. Which means files you may not want to be seen for security reasons, personal or simply embarrassing if they came to light, are waiting to be recovered. Anyone who borrows your computer or laptop could potentially access these files. If you sell it or give it away you don’t know whose hands they fall into so you need to be sure there is nothing there that can be recovered. What you need to do is shred files. File shredding software has the ability to overwrite a file that is to be deleted or the area where the file is stored, with random data. This is called shredding. The software will overwrite this area several times until the file is completely obliterated or shredded. The file then becomes completely unrecoverable and is securely safe. Freeraser works by adding a new recycle bin to your desktop. You can’t drag and drop files into the bin the same as the normal recycle bin. Instead you right click the Freeraser bin and select the files you want to permanently delete. Powerful shredding from one overwrite to 35 overwrites which makes files totally unreadable and unrecoverable. Alert message warns there is a file in the trashcan before it is permanently deleted. A disable of the alert is optional. Eraser efficiently disposes or erases files securely so they can never be accessed again. Eraser will also shred areas of computer where older files that have not been shredded before are stored. So you can have peace of mind if you have never used a file shredder before, ensuring old hidden files and data can never be recovered again. 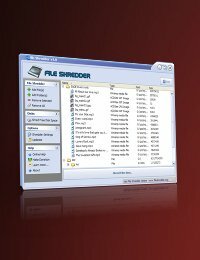 Eraser is perfect with this option of background shredding if you intend to give away or sell your computer/laptop or just the hard disk itself. Eraser ensures no files are ever recovered. It erases previously deleted content. Customisable scheduler for erasing deleted files. File Shredder is another easy-to-use shredder of files. Simply open File Shredder and drag and drop the files to be disposed of into the File Shredder window to securely shred them. File Shredder also has the capacity to shred areas of hard disks were older deleted files reside so they no longer exist to be accessed. Overwrites files with random data multiple times. Five different shredding settings each gradually stronger and more thorough than the previous setting. Disk wiper shreds/overwrites unused disk space where deleted files reside. Supports Windows NT, Windows 2000, XP and Vista.